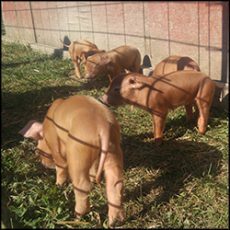 BP Farms takes great pride in our commitment to raising and selling 100% grass fed and grass finished beef, organic pastured pork, organic free range chicken and organic pastured eggs. We believe that healthy animals make healthy meat and eggs. Our farming practices are all sustainable and environmentally friendly. All of our livestock are humanely raised on pasture. Our products are all non-GMO (non genetically modified), fed certified organic feed — and are free of all hormones, steroids, antibiotics, medications, pesticides and herbicides. Our beef is 100% grass fed and raised according to the same standards as the American Grass Fed Association. 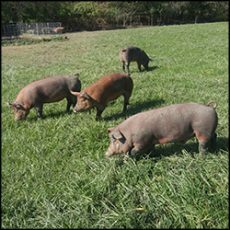 Our pork is from heritage Red Wattle pigs raised on pasture — and our chicken is completely free range with no cages, pens or chicken tractors. Our eggs are from heritage breed hens that range freely on our green pastures and are allowed to forage outdoors all day without cages, pens or other confinement. All our animals are allowed to range freely on pasture. We keep our animals healthy and happy to ensure great tasting meats. When you know what you’d like to order — and when you’d like to pick it up at our farm in Dundee — please place your order here. 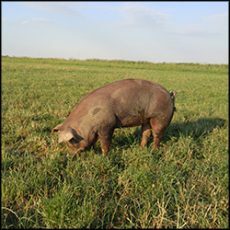 We have a full range of cuts of grass fed beef, pastured pork, free range chicken and eggs in stock that can be purchased without a pre-order. For a full list of all the items we keep in stock please click here.When you know what you’d like to order — and when you’d like to pick it up at our farm in Dundee — please place your order here and we’ll have it ready for you when you arrive.